No wonder Apple is upset and spreading false information about Android. Chart © by Comscore, All rights reserved. The latest graphs shows why. CNN got a good article about that. The market share is rising amazingly fast for Android and keeps steady for Apple. 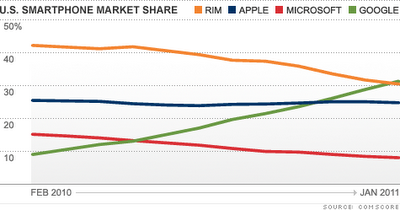 RIM drops below Android and Windows Phone lost, too. Where does this go? Most of the "experts" predicts a great future for Android, and at CNN money they even speak about the "Android Law". So, we all can settle on the success? No way. With the competition coming out with new devices, especially tablets, there is still a market where the combat gets more intense every day. Manufacturer need to lower prices. In fact you haven't noticed, the cheap devices are now coming from Apple. But it's a mistake to think that the price doesn't care. Apple did that many times, and failed long-term every single time. However, the situation for the many Android hardware manufacturers is worse. They need to push out high-quality devices with very low costs. You see it's not the time to stop and forget about. The war is won, but there are still battlefields where the Android-Army needs to be very careful not to screw up.